Wake up rejuvenated each morning, thanks to this beautiful, stylish bed. 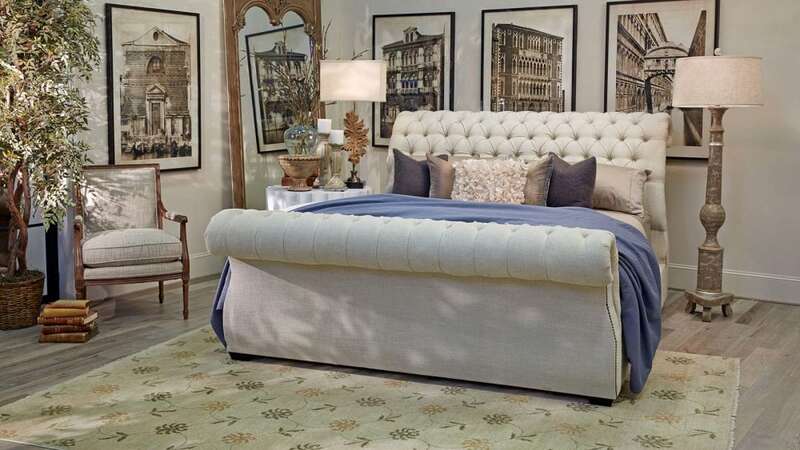 This chic, upholstered, sleigh bed features an elegantly rolled headboard and footboard, both with diamond button tufting. Soft cream linen covers the entire bed, for a fresh look that brightens up a room. The nailhead trim balances out the softness with a slightly rustic addition. Whether you accentuate the classic style or play up the rustic country feel, you'll love the way this style blends right in with your space. Though it looks fit for royalty, this bed was Made in America! Thelinen-upholstered headboard and footboardoffer a cozy retreat whenever you're ready to call it a night. Neutral cream coloring fits perfectly with any color scheme. Button tuftingadorns thesleigh-styleheadboard and footboard. Silver nailhead trimlines the outer boarder for a modern touch. The platform bed fits aqueen-sizedmattress.